Tucked into the beautiful New England region of the U.S., New Hampshire, with its crystal lakes, rugged mountains and hardwood forests, is an ideal host for those slithering, cold-blooded members of the class Reptila commonly known as snakes. According to the New Hampshire Fish and Game, 11 species of snakes are native to the state. The northern brown snake (Storeria dekayi) is relatively small, measuring only 10 to 14 inches long. Marked by large eyes and strongly keeled scales, it varies in color from pale to dark brown. Northern brown snakes are comfortable in both urban and rural habitats and can be found in parks, empty lots, marshes, fields and woodland areas. Widespread throughout New Hampshire, the common garter snake (Thamnophis sirtalis) inhabits backyards, woodlands and meadows near permanent water sources. They are small snakes with brown, yellow or green vertical stripes. Garter snakes are typically active during the day, hunting amphibians, snails, insects, fish and small mammals. Slender and striped in green, white or yellow on a brown or black background, the ribbon snake (Thamnophis sauritus) is typically found in open, sun-washed areas near water. They are fast-moving, active, solitary reptiles. Due to loss of wetland habitats, the state of New Hampshire has ranked the ribbon snake as vulnerable to extinction. Eastern milk snakes (Lampropeltis triangulum) are slender-bodied reptiles that grow up to 36 inches long. They are pale gray, covered in red or reddish-brown splotches outlined in black. Generally found in the woodlands, fields and hillsides of New Hampshire, these snakes are not averse to setting up house in barns and basements. The northern black racer (Coluber constrictor) is ranked as threatened by extinction in New Hampshire due to urban development, road mortality and non-compatible field management. This slim, glossy black reptile grows up to 60 inches long. Despite its moniker, according to Animal Diversity Web, it slithers rather slowly at around 4 miles per hour. The eastern hognose snake, characterized by a small head and upturned snout, is endangered in New Hampshire. Its habitat is restricted to the southern portion of the state along the Merrimack River. Although not dangerous to humans or pets, it does put on a dramatic defense display that includes mock strikes, hissing and playing dead. 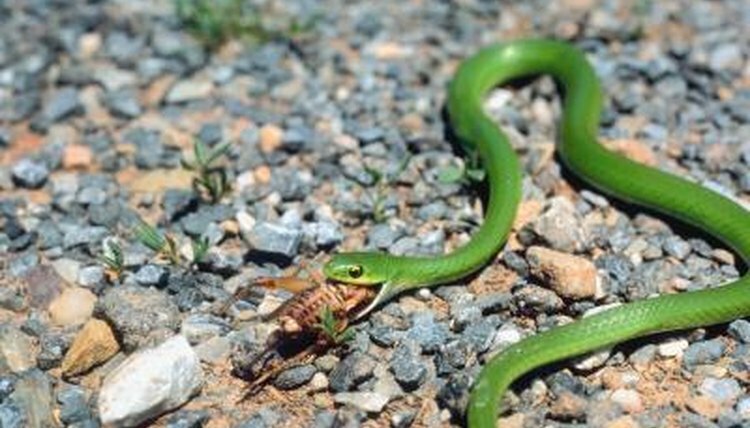 Found in pastures, grassy fields, meadows and blueberry barrens, the smooth green snake (Liochlorophis vernalis) is unmistakeable with its bright green body and white or yellow underbelly. It's ranked as vulnerable to extinction in New Hampshire. Social in nature, these snakes tend to hibernate together and lay eggs in communal nests. The northern red-bellied snake (Storeria occipitomaculata) inhabits a variety of cool, moist environments throughout New Hampshire. They are brown or gray, and reach only 8 to 10 inches in length. These tiny reptiles practice lip curling -- a defensive behavior during which they flick their tongues and curl their lips to show off their maxillary teeth. Northern water snakes (Nerodia sipedon) are dark gray or brown with dark banding. Their bellies are marked with black or red half-moon shapes. True to their name, they reside near still waters like lakes, rivers, ponds and swamps. They can often be seen basking in the sun on the ground, rocks or overhanging branches. Iridescent bluish-black with a bright golden belly and a golden ring around its neck, the northern ringneck snake (Diadophis punctatus edwardsii) inhabits damp, shaded woodland areas throughout New Hampshire. Social with each other but otherwise quite shy, they live in secretive colonies and typically only emerge after dark to look for food. The only venomous snake found in New Hampshire, the timber rattlesnake (Crotalus horridus) is a thick, heavily-keeled, black reptile with a large triangular head and a blunt rattle on its tail. It prefers woodland habitats with rocky outcrops for basking and hibernation. According to New Hampshire Fish and Game, the timber rattlesnake's conservation rank is critically imperiled and it enjoys protected status within the state.